Griz Basketball has a very nice rundown on the Maroon-Silver scrimmage for Montana basketball, which happened on Thursday the 27th. He touched on (or had quotes about) the biggest issue facing the Grizzlies entering the season - frontcourt talent and depth. One of the big questions entering the season will be how the Griz fill the shoes of Brian Qvale, the Big Sky Conference’s leading shot blocker who is now playing professionally in Turkey. Selvig, junior Mathias Ward, sophomore Eric Hutchison and redshirt freshman Billy Reader all played well in the scrimmage. Montana coach Wayne Tinkle said Ward probably has the edge right now to start alongside Selvig in the low post. 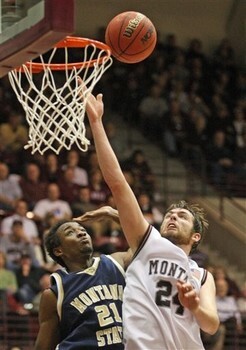 Replacing Brian Qvale is a tall task (pun intended), and Montana doesn't have the personnel for a seamless transition. Derek Selvig is the only surefire starter, but he is not a traditional big man. As Coach Wayne Tinkle said, Mathias Ward has the edge right now. He does some things well, but does not have the rebounding or defensive ability that you would want from a big, especially playing alongside Selvig. My guess is that by the end of the year Billy Reader is going to be the guy alongside Selvig. If they can get solid play from the 5 spot, it will be a great battle with them and Weber State. The Missoulian also had a nice article on the scrimmage, with a lot of info on the post play, as well as a box score. Who do you think will end up getting the most minutes down low for the Grizzlies?